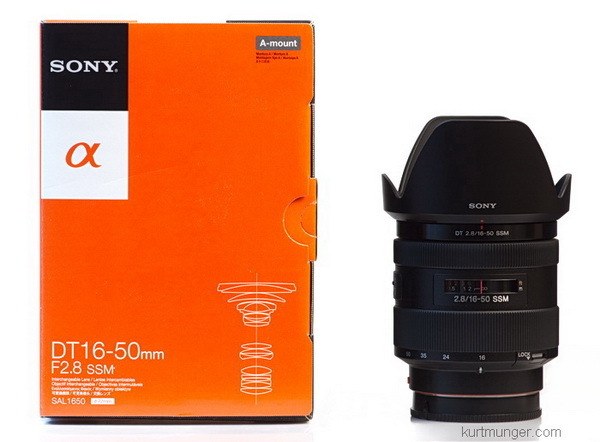 Sony DT 16-50mm F/2.8 SSM review done! Check out the review of Sony's newest alpha mount lens. Like all recently released Sony 'A' mount lenses, the DT 16-50mm F/2.8 SSM turned in a very good performance. What stands out on this lens is the very sharp, (and somewhat expansive) central area; if fact, you won't be able to tell whether you're at F/2.8 or F/8 unless you scroll over to the image sides when magnified. There is a contrast boost at F/4, but that's only noticeable if you compare image crops side-by-side, like I do in the review. The mid-sections are quite sharp at F/4, with the corners staying a little soft at all focal lengths. The Sony DT 16-50mm F/2.8 SSM is a lens that would be perfect for low-light, hand-held street shooting, or portrait photography; the lens is optically maximized at F/4 in my opinion---really. I'm still on the fence about which lens I like better, this one or the CZ 16-80mm. For those of you wondering about how it compares to the CZ 16-80mm, I worked up a comp; it's located at the very bottom of the review page. People wanting instant gratification read below. Comparison with CZ 16-80mm results in a nut-shell: the Sony DT 16-50mm has a slightly better build quality, SSM focusing; it's about one stop faster; and less expensive by about $150; it also weights a little more, and is slightly larger. Optical performance is very similar between the lenses at all focal lengths. People that normally only shoot in daylight would probably enjoy the CZ 16-80mm more. How does the 16-50mm F/2.8 SSM compare to the full frame Carl Zeiss 24-70mm F/2.8 SSM? I don't have that lens on hand, but based on memory, and by looking at old comps, I'd say the CZ 24-70mm is just a little better all the way around, except in ghosting control. Would I rather have the A900 and CZ 24-70mm? Are you kidding? I'll take the A580 and 16-50mm every time, the full frame combo is too darn cumbersome; try wearing a 4lb (1.8kg) necklace for a day! I finally have the new site up and running, check it out! It'll be far more useful and informative than this site because I'll be able to post full sized test images from new cameras and lenses etc, take polls to see what you're most interested in, allow comments and images sent by visitors, and also post larger, and more in-depth interior photography tutorials. Right now, I only have a few basic articles, so the site is somewhat bare, however, this will change quickly as I plan on posting updates far more frequently than I do here. The comments are active on the first couple of posts at Photojottings.com, so feel free to chime in just to let me know how well the system works. It's supposed to work seamlessly with Facebook, Google, twitter and Yahoo, so if you already have one of those accounts, it shouldn't take but a few seconds to start posting. Let me know how easy (or hard) it is to navigate the site, use comments, and the contact form. All updates are supposed to show up on my new Facebook page, so we'll see how that works. I'm new to facebook, so I really don't understand yet the way in which the average person uses it, and what the benefits are. From now on, I'll be posting all new material to Photojottings.com. For the sake of continuity I'll still post new lens reviews to this site until I figure out how to transfer everything over, and that may take some time. The 'about' page is blank at the moment but the site will be devoted to providing useful information to Sony SLR, SLT, and NEX users, people interested in interior/Real Estate photography, photo related product reviews, and taking better pictures without spending much money, that's what I like! I'm also planning on posting old film images from my own collection occasionally, and better yet, high quality scanned images from the Library of Congress that shows what photographers (and cameras) could do 100 years ago with 8x10' glass negatives---it's unbelievable! Note: Kurtmunger.com will continue on as you see it; nothing significant will change except there will be no more general updates. 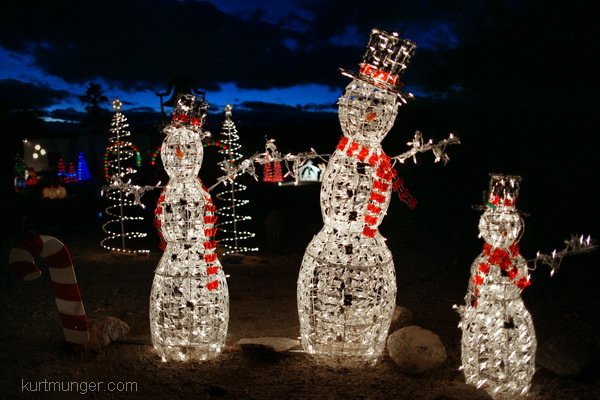 Holiday greetings from the staff of kurtmunger.com! Well, it's really just me here, sitting at my desk, trying to add useful news and reviews for photo buffs with Sony equipment. I run this site daily because I enjoy it, especially 'meeting' fellow photographers from all over the world who willingly share their knowledge as I do to help each other. In a way, it isn't 'just me' is it? I'm going to take a few days off, and when I come back next week, I'll begin to accelerate the news and reviews as I transition to a much newer, faster, and more friendly site! I hope everyone has a joyous Christmas; meet my family below. As always, be safe, and drive carefully! Snow family. Sony A900, 28mm F/2, ISO 800, 1/125sec, +1.00eV. Minolta 28mm F/2 lens. The Sigma 85mm F/1.4 HSM (just reviewed) has been discounted $100, now at $869 until the end of the year. Also, for all you ultra-wide shooters, the super sharp and well built Tokina 11-16mm F/2.8 (review) is $50 off, now $669 through the end of the year. 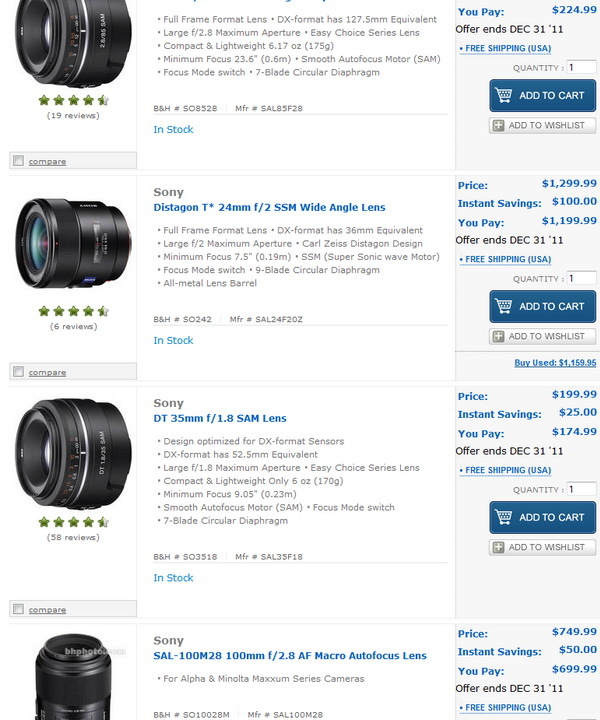 Word is that B&H photo may have a small shipment of Sony NEX-7 cameras coming in before X-mas, so check this link and maybe use the search box too because they don't always use the standard product page for these sales. Their last small shipment Tuesday sold out in a few minutes. Free next-day shipping, last chance before X-mas. Order quickly for free next-day shipping on the hot NEX-5N with 18-55mm kit lens. Don't forget some cool accessories like the 16mm F/2.8 lens (review), and wide angle adapter, which gives the same coverage as an 18mm lens on FF. I don't think the accessories come with next day shipping, so be sure and ask before ordering. Some of these items may be out of stock right after I post this, but I'd appreciate it if you'd come back when they notify you of availability, and use my link when you add it to your cart, that's the only way I get credit for the sale, which keeps the site up and running, thanks! I'm currently working on the Sony DT 16-50mm F/2.8 lens review. So far, things are looking good; it appears at this stage it might be a great match-up to the much more expensive CZ 24-70mm full frame lens. I don't have that lens available for a comp, but I can use my foggy memory and similar images from both lenses to accurately describe the differences. In other news; the new website will probably be launched next week some time, so check back after X-mas for the link. Sony makes mistake and designs the 85/2.8 SAM to perform better than the Carl Zeiss 85mm F/1.4! It's been cloudy and rainy the last few days here in Tucson, so with no real work taking place, I decided to do a stamp shot comparison using the fabulous Sony 85mm F/2.8 SAM against the Sigma 85/1.4 HSM (just reviewed) and the Sony Carl Zeiss 85/1.4. Obviously, there's a two stop difference in light gathering ability, but I know the little Sony 85/2.8 is super good wide open, so I wondered how it would fare against the faster, and much more expensive F/1.4 lenses. Astonishingly, the Sony 85/2.8 is optically superior to both the fast lenses at F/2.8-4; at smaller apertures the results vary depending on location within the image, like corners, centers etc. Since the diminutive and inexpensive Sony performs very well wide open, it makes a great walk around lens for hand-held low-light shooting. You might think a larger aperture is always better for dark conditions because it allows you use lower ISOs right? Have you every tried photographing subjects (or worse, moving subjects) in low-light at 85mm, F/1.4? It's mostly a game of luck, the depth of field is very slim; it's hard enough to focus properly in daylight! I normally use F/2-2.8 for hand-held low-light shots using a focal length around 50-85mm, it gives me a little more DOF to play with. You'll spend $800-1200 extra for the larger, heavier and faster F/1.4 versions. Although two stops of light is huge, there are also huge compromises in designing those lenses, that's why you pay big bucks and get only marginal (if any) performance gains. For those of you looking for a small, pocketable, fast medium telephoto lens, the Tamron 60mm F/2 macro is $384 after rebate. Used as a walk-around prime, it's excellent, see my review here. Folks wanting a high quality telephoto zoom lens, check out the Tamron 70-300mm, now $359 after rebate! Tamron 70-300mm F/4-5.6 Review here. Sigma 85mm F/1.4 EX DG HSM review. The Sigma 85mm F/1.4 EX DG HSM is a fast, medium telephoto lens suitable for portrait, environmental and landscape work, but also performs well in available light, hand-held conditions, such as night time street scenes, (but watch your DOF!). This somewhat large lens has a very good build quality, well implemented HSM focusing, and provides excellent center sharpness at F/1.4. Not surprisingly, this lens performs nearly the same as the Sigma 50mm F/1.4 HSM reviewed here a few months ago. I would prefer the Sigma 85/1.4 HSM over the Sony CZ 85/1.4 for hand-held low light use because of the better control of axial color fringing at wide apertures, and the stunningly sharp centers. Also, the Sigma's HSM focusing was more accurate on my A900 and A580 than the Sony CZ 85mm, but your results might not be the same as camera and lens calibrations will vary. 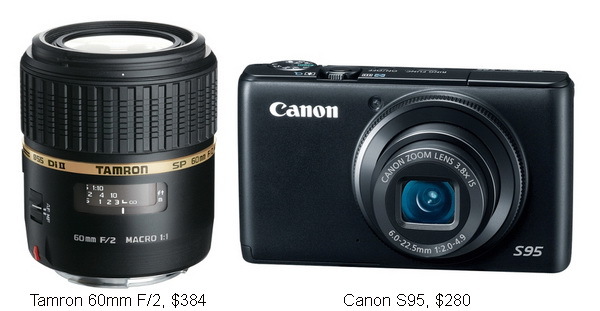 See the bottom of the review page for a comparison between these two lenses, you'll be surprised! If you're on a tight budget, and want this focal length but don't need F/1.4-2, then consider the spectacular Sony 85mm F/2.8 SAM; it's my second favorite Sony prime lens. The first time I used this lens I photographed a Realtor for a business portrait, and paid for the lens with that job! Although, quite frankly, you don't need a super sharp lens for website and business card images. Sale items and Sony HVL-F58AM review. The Sony HVL-F58AM marks the last Sony flash review I'll be doing for a while, at least until they come up with a new one. 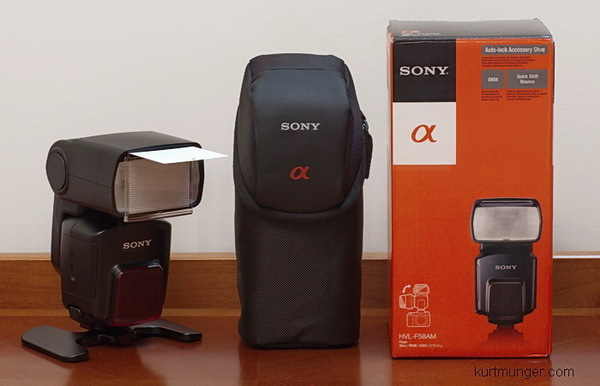 The F58AM is Sony's top-of-the-line flash, with the most power, (but not power levels), and suitable for rapid use, and the studio because of the external battery pack adapter plug, and off-camera cable plug. Like the F43AM, it has modeling flash and multi-flash emission, and it can be used as a controller for other flashes, however, this is not easy. I thought I'd try something dumb, like controlling a combination of the discontinued F42AM, F56AM and the F43AM and F58AM. The older flashes are compatible with this new control system, but they must be set differently than the new flashes. This system really does work, but it's pretty hard to figure out initially; I prefer simple off-camera radio flash triggers, they're easier to set up, with a much longer range and are far more reliable. However, if you're using your flashes for product shots or in a small room etc, then the optical wireless system will work fine. If you're in the studio, you can buy real studio strobes for less money, and have much more power with quicker recycling times. Small camera flashes are meant to be handy, but they have their limitations. The flash I reviewed a couple weeks ago (Sony HVL-F43AM) is now on sale for $299, and the top-line Sony flash (HVL-F58AM) is $399, that's $100 off the regular price. 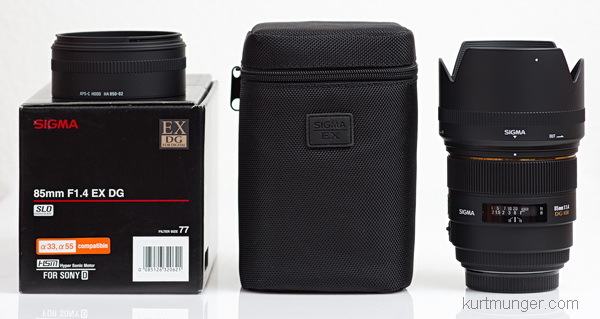 For those interested in a fast telephoto zoom lens, the Sigma 70-200mm OS EX DG HSM is on sale through the weekend for $1250, that's $150 off the regular price. Sony DT 16-50mm F/2.8 SSM in stock, and stuff coming up. Hopefully, I'll be reviewing the new Sony 16-50mm F/2.8 soon. In the mean time, if you want one, they're currently in stock at B&H Photo with free shipping in the US. I'm putting the finishing touches on the Sigma 85/1.4 HSM review, with a very interesting comparison with the Sony CZ 85/1.4. Look for the full review in a few days or so. Also, I have the Sony HVL-F58AM review about done, and I'll post that soon. Whoops, I forgot to mention I tested the Sigma 8-16mm with the Sigma 10-20mm F/4-5.6, at 13mm and 16mm, and found the results almost identical, so who cares right! I put the comp at the bottom of the APS-C super-wide zoom page if you're bored. ...good through the month of December! Included is one of the very best Sony lenses, the 35/1.8, (review) now $175, which has been on my recommended list since it came out, and would make a great stocking stuffer. Also check out the Carl Zeiss 24mm F/2, $100 off, and Carl Zeiss 24-70mm, $150 off. You portrait and sports shooters can get $500 off the 300/2.8, (review) now $5800! The new Phottix flash triggers pictured below are making the rounds on just about every photo equipment review site, usually saying that Sony users finally have an option for wireless flash triggers. Unfortunately, the readers, (and apparently the reviewers too), aren't aware that you don't need to use Sony flashes at all. You could use Canon or Nikon, in most cases, the camera doesn't even know the flash is going off with these simple types of triggers. All cameras with a hotshoe, (Sony type or standard) can automatically send a pulse at shutter press through the hotshoe post, to the transmitter; and that signal is carried through to the flash receivers, which then fires the flash unit. So if you have a Sony camera you can use just about any type of modern flash unit with nearly any type of radio trigger system, although you will have to get a hotshoe adapter to fit the standard type transmitter to the Sony proprietary hotshoe on the camera. 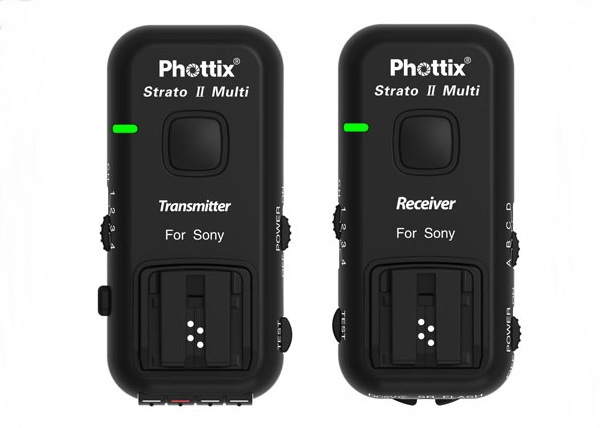 The new Phottix strato II for Sony simply eliminates the need for the adapter, and allows you to use your Sony flashes without adapters. B&H Photo carries the same type radio of flash triggers with standard type hotshoes. Additional receivers here. 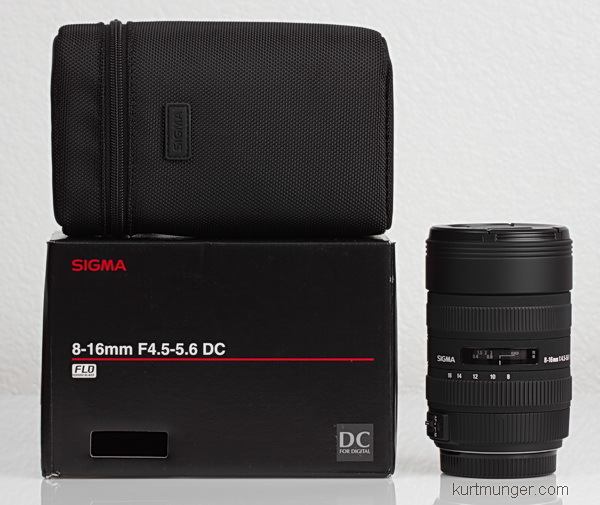 Sigma 8-16mm F/4.5-5.6 DC HSM review. 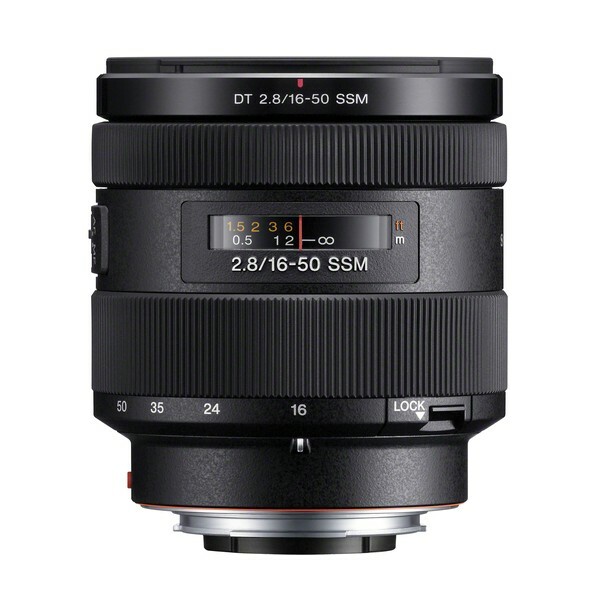 The Sigma 8-16mm F/4.5-5.6 DC HSM ultra-wide zoom is a specialty lens, meaning it will probably appeal to a rather small segment of people that really want wide, and I mean shoes-in-the-picture wide! This lens (at the widest focal lengths) begs to be jammed in the middle of an interesting plant or work of art, or taking non-traditional views of urban environments. Folks wanting this type of lens should not be too concerned about the technical image quality, and instead focus their interests and efforts on effective composition. My first outing with a lens like this produced a whole memory card full of awful images because I didn't know how to use it. If you just want an ultra-wide lens for fun, check this one out. For those of you that are concerned about the image quality of the lens, here's my take: it's very sharp over most of the frame at F/5.6 between 8-10mm; around 12-16mm the mid-sections and corners don't quite match the centers, but the performance is still very acceptable. Light fall-off is very low, ghosting control is slightly above average in most cases, color fringing control is average for this type of lens, and overall handling is quite good. The distortion pattern is typical for this ultra-wide zoom class, and is mostly correctable in post processing. I found the auto-focusing to be very accurate, which is unusual for an ultra-wide zoom lens. This is not a very good interior/Real estate photography lens because it's simple too wide over most of the zoom range. Try properly lighting a room when using 8mm, it's basically impossible. Plus, the exaggerated view just doesn't look believable. If you want to sell your photography to an architect, interior designer, homebuilder or Real Estate agent etc, your work needs to be believable, not funny or artsy. For good looking Interiors, start in the 14mm (20mm full frame) range, but try to stay at 16mm (24mm FF) or longer. A more useful focal range for interiors would be; Sigma 10-20mm F/4-5.6 EX DC, or the Sigma 10-20mm F/3.5 EX DC HSM. The Sigma 8-16mm doesn't have quite the same expansive coverage as the full frame Sigma 12-24mm when both are at their widest setting, but the 8-16mm performed better overall, and of course is much wider on an APS-C camera. I would highly recommend the Sigma 8-16mm F/4.5-5.6 DC HSM for landscapes and artistic photography, especially when using 8-10mm! Note: Sigma HSM lenses have focusing problems with the new A/65/77, you have to send those lenses back to Sigma for work. See Sigma's website in your country for more info.